As the pastor of New Life, I get asked from time to time the question, what is White Horse Ministries? Well, here’s the story. Years prior to beginning our church, God gave my dad a very vivid dream. He knew this dream was not just bad chili from the previous night’s supper, but it stood out and made a lasting impression. We knew God had often used dreams throughout His Word, from Genesis to Revelation, to communicate and reveal His plans and purpose to His people, but we never realized just how fast a dream could become a reality. In this dream, my dad stood on the edge of Yonah / Homer road as he watched a white horse come running through our community. The white horse had a countenance full of the strength and determination of God; he had a purpose and a destination that could not be stopped. What this white horse represented remained a mystery to him for a long time. He continued to pray for the understanding and told many people his dream and many people offered their suggestions as to what this white horse represented, but nothing seemed to make sense. Two years later, in the spring of 2002 God impressed on our hearts to begin a church in our community. We rented a local building for our first services. We named the church New Life to represent the new life we were beginning in God. New Life was a church for those who were outcast, lost, hurt, and at their wits end. New Life was a church similar in many ways to King David’s first congregation in the wilderness. Before David’s first congregation became the Mighty Men of God in 2 Samuel 23:8, they were a congregation of misfits according to 1Samuel 22:2. God later took this group of misfits and raised them up to be Mighty in God. 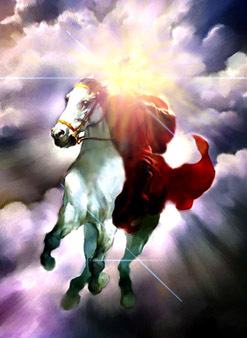 A man stopped by one day to visit my dad and told him that the Lord had showed him what the white horse of his dream from years before represented. Hearing this many times before, my dad didn’t get too excited, but when the man told him that the Lord had informed him that the white horse in his dream was this new church, the Holy Ghost brought an immediate confirmation to his heart. It was comforting to know that God had planned this church many years before we had even thought about building it. Looking back, we can now see how God moved many obstacles and opened many doors for this church to be built. By Faith, on March 17, 2002 we held our first church services with only a kerosene heater for heat, and a porta-potty for restrooms. With less than ten people in average attendance we pressed forward with determination trusting and believing that our God would meet our every need and accomplish the purpose he created us for. As the weeks passed, the attendance began to grow fast. Within a matter of months we soon realized that we had to find a larger and more stable home for our growing congregation. In the summer of 2002, we began to clear the land for our new church. God poured out His blessings in all areas. On February 16, 2003, with our church not even a year old, we moved into our new sanctuary. To sum it up, New Life Fellowship was built by God to not only reach this community, but the entire world. Each year we continue to grow, moving ever closer to the purpose that He has created us for. White Horse ministries simply represents our burning passion and determination as His church, to spread the gospel of our Lord Jesus Christ.